Just how popular is Sister Jean Dolores Schmidt? So popular that items featuring the Loyola chaplain are flying off the shelves. NBC 5's Mary Ann Ahern has the story. If you had to guess the world’s most famous religious licensing icon, who would you pick? The Pope? Jesus? Maybe the Dalai Lama? Not so, say sports fans and marketers alike: Loyola University’s Sister Jean may take the cake. In the span of just a few weeks, the 98-year-old nun has gone from local to international stardom for her role as the team chaplain for the Loyola men’s basketball team. The Loyola Ramblers have emerged as the biggest underdogs in college basketball, pulling off upset after upset through the NCAA’s March Madness to wind up in the Final Four for the first time since 1963. 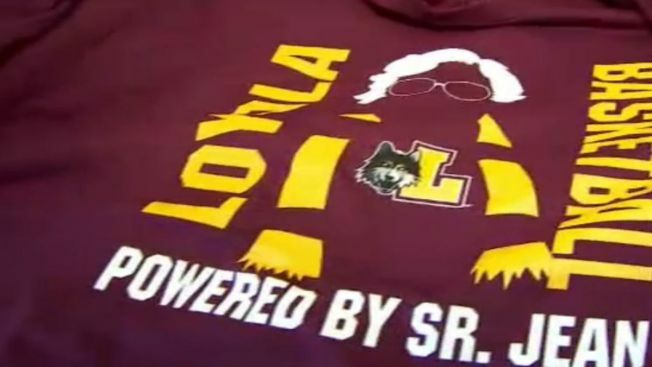 In the meantime, Sister Jean has emerged as a cultural icon, and with that celebrity comes specks of gold: she’s given her blessing (wink) for Loyola to use her image for marketing and sales. That means socks, bobbleheads, and a lot of T-shirts — at least 25 variations being sold by Loyola University’s campus bookstore right now. Sister Jean lives on Loyola’s campus in the San Francisco Residence Hall, and students — not just basketball players — often chat-up the nun around Rogers Park. Loyola students and basketball nuts aren’t the only ones cheering on Sister Jean this March Madness. Sister Monica Seelman, another Rogers Park resident, belongs to the same religious order as the basketball chaplain and coaching assistant: the Sisters of Charity of the Blessed Virgin Mary. Sister Monica was also a student of Sister Jean’s when she taught at Mundelein College before arriving at Loyola. Now, although Sister Monica is retired, she told NBC 5 Sister Jean’s story is a lesson for anyone who thinks that age is anything except a number. The money made in Sister Jean-related sales will not line the nun’s pockets — instead, it’ll mostly go back to the school with a few percent set aside for the Sisters of Charity.